Okay, so you’ve decided freelance design is what you want to pursue as a career. (If you’re not sure freelancing is right for you, read part one of this series here first.) What you need to know is that freelance work doesn’t grow on trees, and there are some strategies you’ll need to incorporate to get cash flowing. Again, for this article, we reference interviews we conducted with two senior graphic designers at Independence University. 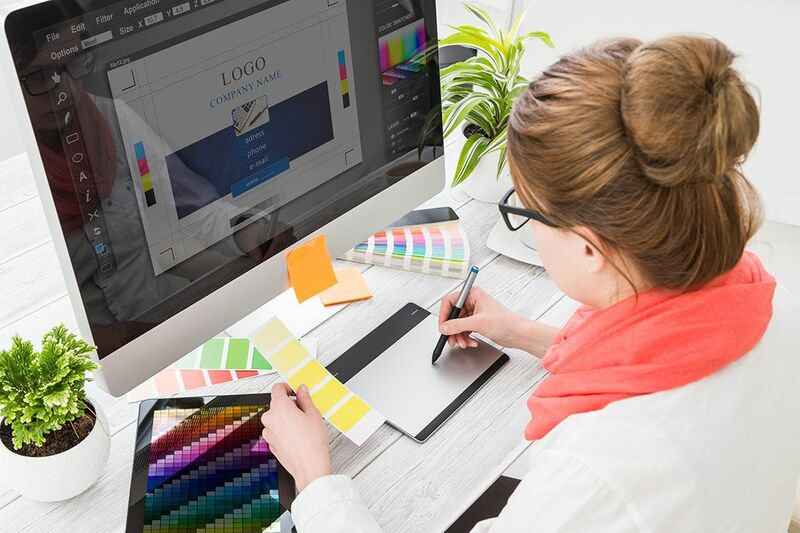 One of the most important things you can do, even while still pursuing a degree, is to build a graphic design portfolio. Once you’ve started to build a collection that shows off your skills, you need to make it accessible to potential clients. This usually means putting your portfolio online. Whether you build the website yourself or host it on a content management system, get your work out there so it can be seen. An online portfolio is important because it demonstrates to potential clients what you’re capable of. “Most clients and employers will weigh your portfolio over your educational background,” said Billy. If you want professional work, you need to look like a professional, and branding yourself will go a long way toward making that happen. Give yourself a signature look, and make sure it’s consistent across all your advertising fronts: business cards, flyers, website, etc. You’re a graphic designer, and that’s first evident in the design you put together for yourself. Pick a specialty, and market yourself in that direction. The opportunity to do other things will open over time, and you can always rebrand yourself to fit your needs. But without a direction, you’ll find it harder to be taken seriously. It goes without saying, but you’re going to need to know people. According to Billy, “Keeping a steady stream of work means you’re constantly selling yourself and looking for your next job.” So, get out there, attend conventions and seminars where you can meet professionals, and be ready to open your mouth and offer a business card wherever you go. You never know where you’re going to find your next client. Potential customers are not the only people you’ll want to meet, though. Be sure to network with other designers—they can help refer you to clients, accomplish work outside your specialty, and inspire you when you’re in a rut. “Adapt,” Christensen said. “Be willing and able to learn new things and to adapt your technique.” As a freelancer, you have the chance to try anything. It’s a huge opportunity, but it also means stepping outside your comfort zone. Be prepared to learn new skills, change strategies, and grow as a person in pursuit of your chosen career. We hope this two-part guide has given you some useful insight to help you start your journey as a freelance graphic designer. Remember, you’re not the first to walk this road, and there’s a wealth of information and resources out there to help you succeed. Don’t be afraid to ask questions, don’t be afraid of hard work, and don’t be afraid to keep trying. The dream of being successful is within reach. Request more information about earning your degree in graphic arts from Independence University. For graduation rates, the median debt of graduates, and other data, see independence.edu/student-information.